History flows like a river but most of the time we concede we’re only privy to a small section viewed from the shore. 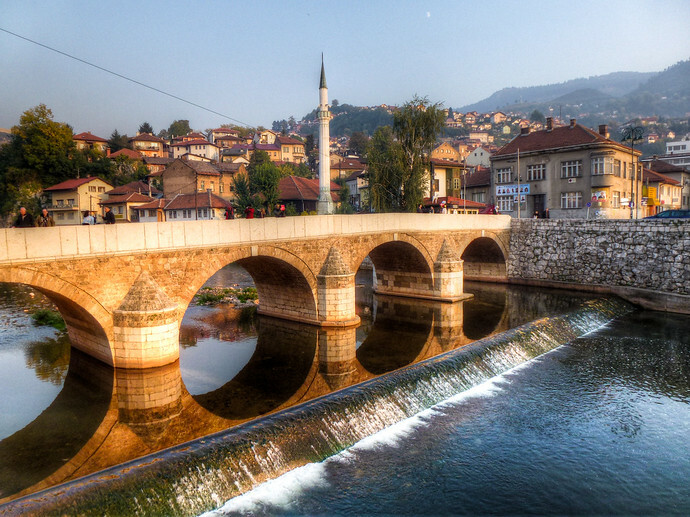 But along the small Latin Bridge in Sarajevo over the shallow waters of the Miljacka River, history happened all at once and almost not at all. The 28th of June, 1914 began with Archduke Franz Ferdinand along with his wife Sophie, visiting the capital of Bosnia and Herzegovina, Sarajevo; then a province of the Austro-Hungarian Empire. Ferdinand had went to Bosnia a few days prior to observe military operations, sent by his uncle Emperor Franz Josef. Bosnia and Herzegovina was annexed from the Ottomans in 1908 by the Austro-Hungarian Empire and Ferdinand was there to wave the flag (in the face of Serbian nationalists who made claim to the territory. 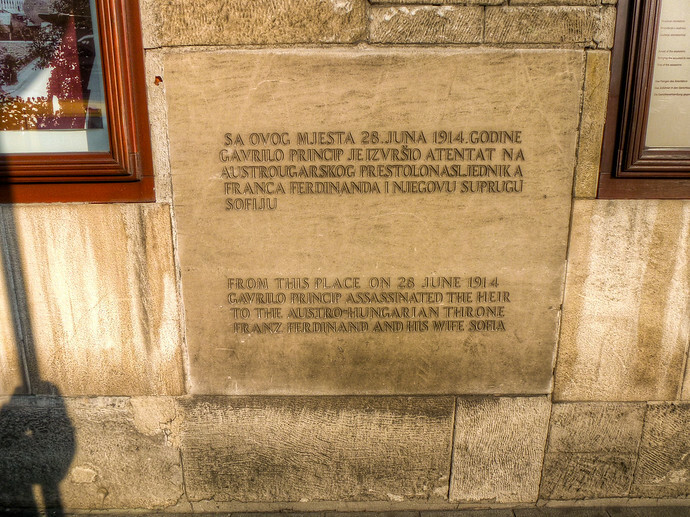 Ferdinand was to inaugurate the new state museum in Sarajevo, accompanied by his wife Sophie who worried for his safety. On the morning of June 28th, Ferdinand was touring the city in his motorcade. He passed Muhamed Mehmedbasic, one of several Serbian nationalist conspirators who had planned to assassinate Ferdinand. Fearful, Mehmedbasic never used the grenade in his possession. The motorcade passes unmolested until coming across Nedjelko Cabrinovic, who did toss a grenade at the Archduke’s car. Bouncing off the vehicle it exploded behind Ferdinand’s car (since the driver sped up upon seeing it) injuring several members of Ferdinand’s entourage seriously. 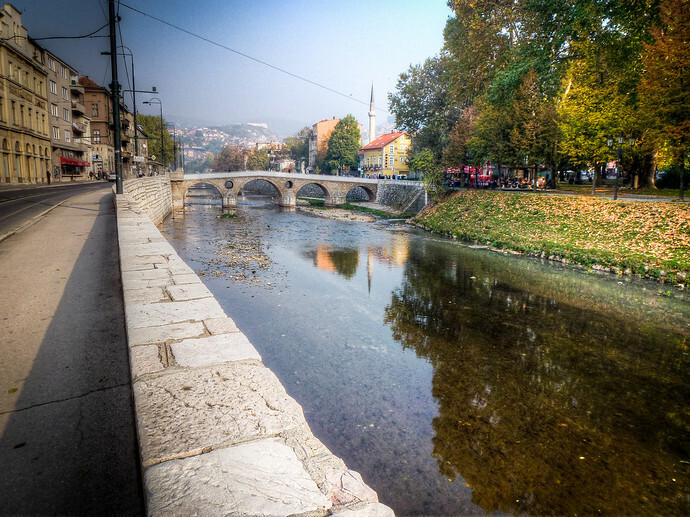 Cabrinovic tried to kill himself by jumping into the Miljacka River which is often shallow. Only centimeters deep that particular day, Cabrinovic probably thought the expired cyanide pill he swallowed would finish him. As it were, the pill only made him ill and he was arrested. So, Ferdinand is still alive, having cheated death twice and a number of Serbian nationalist assassins have time to contemplate how it all went wrong. And wrong again. Plus some. One of Cabrinovic’s co-conspirators, Gavrilo Princip, frustrated with the morning of failed killing, went to a cafe on nearby Franz Josef Street, sulking at having missed all assassination opportunity. 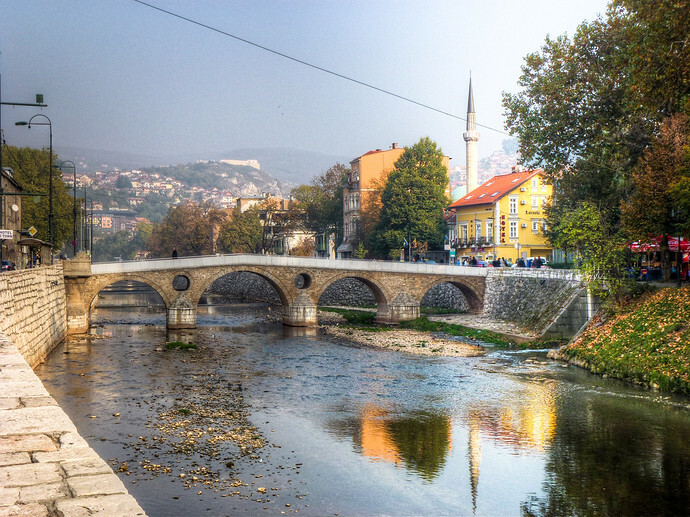 Elsewhere in Sarajevo, after some time passes, Ferdinand decides he wants to visit Sarajevo Hospital where the injured have been taken. Military officer General Oskar Potiorek, traveling with Ferdinand, advises the caravan avoid the city center. For unclear reasons, Potiorek never told the driver that. So, Ferdinand’s convoy continues across the Latin Bridge, makes a right turn… right on to Franz Josef Street. To Princip’s surprise Ferdinand’s car rolls towards him. The driver by now has been made aware of his mistake, tries to reverse, stalling the car’s engine in the process. Car stuck and seizing the opportunity, Princip opens the door shooting Ferdinand and Sophie. Both die within an hour; mobs attack Princip, disarming him. He’s later arrested. Austria-Hungary blames Serbia for the plot, declaring war one month later. Allied nations jump in to support both sides and World War I officially begins. 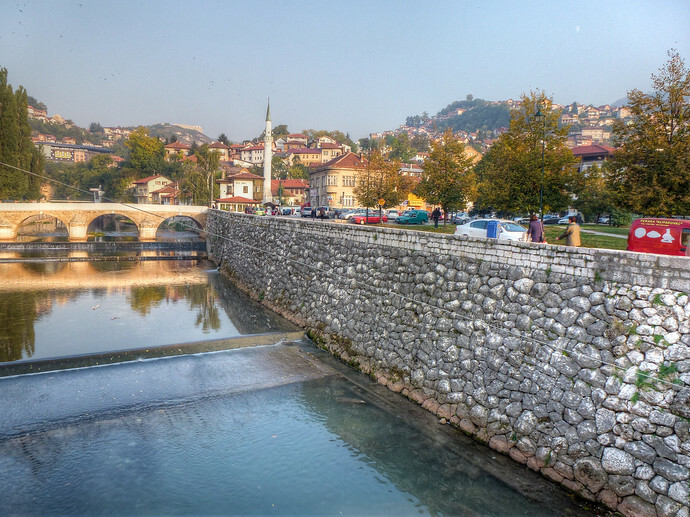 Today, you can walk across the Latin Bridge, built in the 1550s by the Ottoman Empire, and see the plaque noting where Ferdinand and Sophie were killed on the corner of Franz Josef Street. Their assassination story is one of my favorites from history for the sheer amount of circumstance and implication of fate. Visiting these sites during a HYH City Tour (whom I highly recommend) was one of many highlights from my visit to the city you voted best to visit in 2012.